Captain D’s gears up for the 2019 Lenten season with the launch of two new seafood sandwiches: the Giant Fish Sandwich and North Atlantic Lobster Rolls. The Giant Fish Sandwich consists of two pieces of batter dipped fish, tartar sauce and lettuce on a warm, toasted bun. Meanwhile, the seafood chain’s new North Atlantic Lobster Rolls feature North Atlantic lobster and lettuce served on a buttery roll, New England style. Both sandwiches are available on their own for s suggested price of $3.99 each, or as part of a combo that includes a classic side and a drink through April 28, 2018. Prices may vary by location. 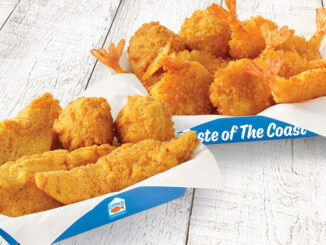 Captain D’s Introduces New $3.49 Seafood Snacks – Welcomes Back Family Meal Special For 2018 Holiday Season.